Ferro M. La Gran Guerra 1914-1918. 2014. Alianza Editorial. Gallo MIP. La prensa madrileña de información general ante la epidemia de gripe de 1918-19.Medicina & historia: Revista de estudios históricos de las ciencias médicas. 1995; 57:1-16. Dávila BE. La Gripe Española. La pandemia de 1918-1919 España: Centro de Investigaciones Sociológicas. 1993. Ansart S, Pelat C, Boelle PY, Carrat F, Flahault A, Valleron AJ. Mortality burden of the 1918–1919 influenza pandemic in Europe. Influenza and Other Respiratory Viruses. 2009; 3: 99-106. Erkoreka A. Origins of the Spanish Influenza pandemic (1918–1920) and its relation to the First World War. J Mol Genetic Med. 209: 3:190-4. Soto RA. (2010). Temporal and Spatial Distribution of the 1918 Spanish Influenza in Mexico. En C. Academy (Ed.). Historical Influenza Pandemics: Lessons Learned” Meeting and Workshop Abstracts, (pág. 24). Copenhagen, Denmark. Ayora-Talavera G. Influenza: Historia de una enfermedad. Rev Biomédica. 1999;10: 57-61. Webster, R. G., W. J. Bean, O. T. Gorman, T. M. Chambers, and Y. Kawaoka. Evolution and ecology of influenza A viruses. Microbiol. Rev. 1992; 56: 152–179. Jang J, Bae SE. Comparative Co-Evolution Analysis Between the HA and NA Genes of Influenza A Virus. Virology: research and treatment, 2018; 9:1178122X18788328. Ghedin E, Sengamalay NA., Shumway M, Zaborsky J, Feldblyum T., Subbu, et al. Large-scale sequencing of human influenza reveals the dynamic nature of viral genome evolution. Nature 2005; 437: 1162. Richt JA, Lager KM, Clouser DF, Spackman E, Suarez DL,Yoon KJ. Real-time reverse transcription-polymerase chain reaction assays for the detection and diferentiation of North American swine influenza viruses. J Vet Diagn Invest 2004; 6: 367-73. Gómez LA. Genoma Humano y Salud Pública. En: Malagón-Londoño G, Moncayo-Medina A, editores. Salud Pública. Perspectivas. Tercera edición. 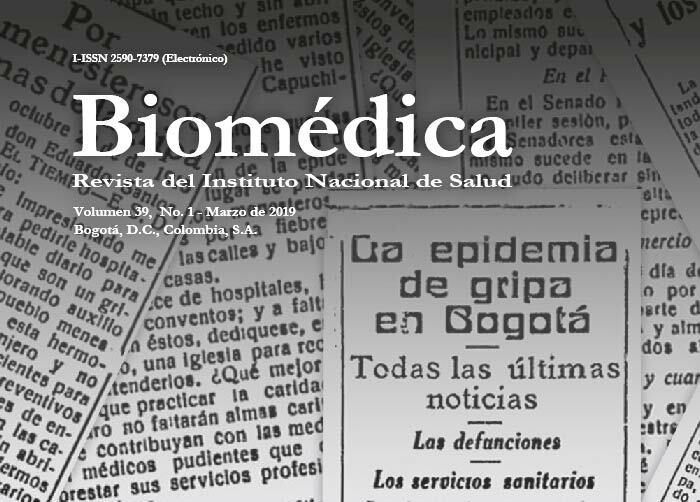 Bogotá: Editorial Médica Panamericana; 2019. En prensa.